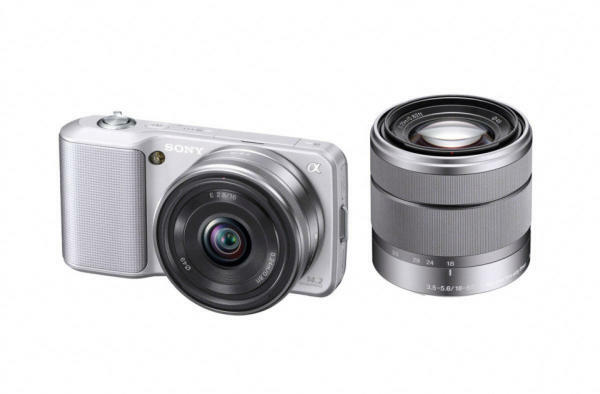 Sony has come out with its new Alpha NEX-5 camera and claims that this point and shoot camera can also be used as a DSLR? We were like hnh? This little thing? Yes. This small lightweight camera has an image sensor that is found in DSLR cameras as well as interchangeable lens capability. This baby shoots AVCHD 1080i video as well with no hassle of focusing, has a 7 fps burst mode and will even take 3D-ready Sweep Panorama images. Ok now that is hard to believe. The NEX-5 is the “world’s smallest interchangeable lens camera,” according to Sony. It being tiny and lightweight this camera is mind blowing. Imagine a lightweight digital camera with the capabilities of a DSLR. One of the key reasons the NEX-5 and similar cameras from Panasonic, Olympus and Samsung are so compact is the fact they do not have bulky mirror box assemblies. Although this reduces size, it impacts focusing speed. It is made of plastic and not of magnesium alloy that is this is $100 cheaper than the more expensive models. The NEX-5 is very small, measuring 4.4 x 2.4 x 1.6 (WHD, in inches) and weighs 14 ounces with flash and 16mm pancake lens attached, around 18 ounces with the 18-55mm zoom. The front of the camera doesn’t cater much room anything other than the lens, nice textured grip, lens release button, AF assist lamp and low-key logos. The NEX-5 features the new E-mount lenses, doesn’t leave you with many options like the true DSLRs but Sony does promise a new 18-200mm lens this fall. The NEX-5 uses an APS HD sensor, the digital factor is 1.5x, like Canon DSLRs, so multiply that number and you get the true 35mm equivalent i.e. the 16mm pancake lens is actually a nice 24mm wide-angle. Aesthetically, the optional lens rings are brushed aluminium and the flash is also silver coloured	so this looks a bit awkward on the black body. There is a solution for people who are too picky about looks; they could buy the silver version of the camera. There is a stereo mic, playback buttons, an on/off switch and a shutter button on top of the camera. There is a smart accessory terminal on the grip for the flash that comes along with the camera. The camera was so small that it was hard to place a flash inside the body. This port can also be used to attach optional stereo mic for better quality AVCHD videos but this kills space for the flash. There is a brilliant 3-inch variable angle LCD screen at the back of the camera that moves up about 80 degrees and about 45 degrees down which makes it easier to shoot from any angle. It uses Sony’s Xtra Fine LCD with TruBlack technology so there are no issues even in direct sunlight. To the right of the screen are two soft keys, a red Movie button and a jog wheel with a center set button. There are four options on the jog wheel that are flash, exposure compensation, bust/self-timer and display. On the left of the body are two compartments for USB and mini HDMI outs. The bottom has a metal tripod mount and battery/card compartment. This camera uses Memory Stick Pro Duo or SD cards. It accepts the newest Pro-HG Duo and SDXC media but you better make sure that whichever card is used must have at least 4GB capacity and is high-speed. The box comes with the camera, the lens of your choice, a lithium ion battery, plug-in charger, USB cable, attachable flash and CD-ROM. The disk has Picture Motion Browser ver. 4.3.01, Image Data Converter SR 3.1 and Image Data Lightbox software for developing RAW files and handling photos. The camera is due to release later in July. And to be honest we cannot wait to see what this tiny camera can do. Awesome, compact camera with 18-55mm lens and can support 18-200 WOW!